A study by Hawkins International PR about the luxury market revealed some interesting trends as the new year gets rolling. The New York City-based luxury and lifestyle firm detailed what’s "in" and "out" in the industry, highlighting emerging services such as bars that come to you, customer care based on social media, train tours and local literary partnerships. Here’s a look at what Hawkins unveiled. While some confident partygoers may say that the bar comes to them figuratively, this is meant in the literal sense. Rolling bar carts and trolleys to customers appears to be a developing trend. At 45 Park Lane in London, a Bloody Mary trolley greets brunch guests, stocked with top-of-the-line local ingredients. At The Inn at Little Washington in Virginia, a cow-shaped cheese cart dubbed “Faira” delivers an assortment of fine cheeses from around the world. And the Omni Royal Orleans has a martini cart that offers double-sized martinis for $2.00. Wait, that’s not how the Kiss song goes? Well, that appears to be the sentiment for travelers these days. In response to demand for a luxurious night’s rest, hotels are emphasizing special sleep offerings to guests. Hotel Vermont in Burlington has a bedtime menu with cozy amenities, including a Lunaroma aromatherapy collection, Vermont flannel pajama sets, Vermont teddy bears, bedtime stories and a hot toddy selection. The Omni Grove Park Inn in Asheville, N.C., boasts temple balm and reflexology foot treatment, as well as “Good Night Wishes” card with tips for relaxing. And The Dorchester in London features a “Sleep Deeply” massage that eventually sends guests into dreamland. Does the number zero haunt you in your sleep, causing you to toss and turn at night? Well, chances are, you are one of those travelers who are fed up with having to dial zero every time you need something done at a hotel. In response to the growing frustration (and increasing amount of nightmares), hotels are offering the ability to request help through text messages and social media. Three Loews Hotels are taking requesting through text messages, with replies guaranteed in four minutes. The chain also debuted a program that accepts “social reservations” through Twitter. Tweet @Loews_Hotels with the hashtag #BookLoews and a Loews travel planner will assist with your reservation. The Nines in Portland offers a “Nine Touch” app that allows guests to chat directly with hotel staff through their mobile devices, covering requests such as room service, local event planning and transportation. And Sawgrass Marriott Golf Resort & Spa's boasts the “Red Coat Direct” program, which allows meeting planners to text hotel staff with questions, comments or requests. While fancy baths have been offered for a while, more hotels appear to be customizing the experience these days. Hotel Madeline in Telluride, Co., offers a "bath bar," as well as a "bath barista," who customizes your bath with bath salts, facial cleaners, facial oil and body oil infused with lemon, juniper, cardamom and more. Lake Arrowhead Resort in California provides a “bath butler” who delivers amenities like Bamboo Lemongrass Foaming Body Scrub and Bamboo Lemongrass Body Crème. The ingredients change with the seasons, as special products are offered for Valentine's Day and other occasions. Seabourn Cruise Line invites guests staying in their Penthouse Spa Suites to personalize their baths by choosing from a vast menu of luxurious bath sponges and designer soaps by Hermes, L'Occitane, Baudelaire and Salvatore Ferragamo. The development of designer bikes has added a new dimension to hotels, and a new luxury for travelers. Hotels are now collaborating with designers to create custom bikes that express the style and uniqueness of the property. Gramercy Park Hotel in Manhattan worked with Lorenzo Martone to create "the Christian Louboutin" of bicycles for guests. The bikes are all white, except for Martone's signature bright red chain. Le Meurice in Paris offers pistachio-green bicycles with all the trimmings, including a green basket and elegant gold bike locks. 45 Park Lane in London invites guests to take a spin on bespoke Brompton bicycles in the hotel's signature purple color. And Maine's Chebeague Island Inn—located 10 miles off the coast of Portland—allows guests to explore the island with custom L.L. Bean-designed bikes. 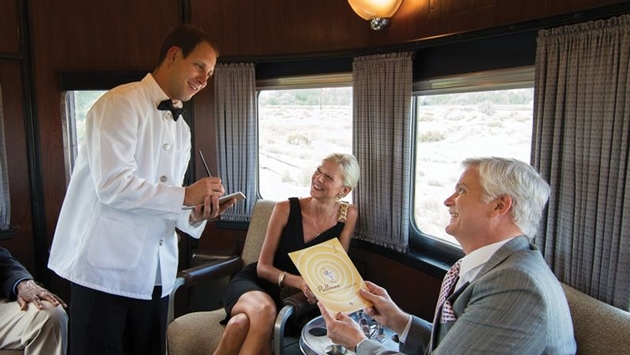 Train tourism is one of the hottest trends at the beginning of 2014. Mongolian tour operator Nomadic Expeditions is unveiling four new rail trips for 2014, with trans-Siberian routes spanning from Moscow to Beijing and Ulaanbaatar to Moscow. Luxury tour operator Big Five Tours & Expeditions boasts a 13-day Madagascar trip that lets travelers observe lemurs in Analamazotra Special Reserve, visit workshops of crafters and artisans, meet the famous Vezo fisherman of Anakoa, and experience culture and scenery on a day-long train journey through the rainforest. You can buy a general bestseller at the airport, or you tap into the local literature at your hotel. Hotels are forming local literary partnerships these days. Hotel Vermont in Burlington has partnered with the Burlington Writers Workshop to publish new writing on a quarterly basis. Each guest room will be stocked with original works by workshop writers. Guests can even take the works home with them. The Nines in Portland has formed a partnership with the famous Powell's Books, the largest new and used bookstore in the world. In effect, The Nines is able to offer more than 3,000 books in the hotel's on-site library. New Orleans-inspired food is beginning to spread around the globe, like Vietnamese, Scandinavian and Korean cuisine before it. Jean-Paul Bourgeois, Chef de Cuisine at the Gramercy Park Hotel in New York, brings his Bayou background to the table with an in-room menu featuring JP's Po-Boy (cornmeal battered shrimp, Tabasco mayo, pickle, lettuce and tomato), the Bourgie Burger (8 oz. La Frieda ground burger with all the trimmings served with Cajun Spiced fries) and more. The Westin Grand Cayman Seven Mile Beach Resort & Spa is home to Executive Chef Michael Farrell, who features a NoLa-inspired Southern Coastal style to the Caribbean with dishes like Shrimp and Grits, and Seafood Gumbo. Travel will always serve as a means of escape, but, as more and more travelers get cozy in locations around the world, destinations are beginning to feel more like home. Short-term home and apartment rental sites like Homeaway and Airbnb are starting to focus on homelike experiences, while luxury hotels are offering more personalized options. The Lodge at Doonbeg in County Clare, Ireland, features suites and cottages, all tailored with modern conveniences such as full kitchens and spacious living rooms. Comforts include gas fireplaces and large book selections, as well as bespoke furnishings, fabrics and hand-selected antiques. Guests can dine at the Lodge's two full-service restaurants, or arrange for room service to deliver ingredients for a barbeque or pizza party. Lungarno Collection, the Ferragamo family-owned hospitality group, will launch a new property called Portrait Firenze in May. The hotel is the second to feature the collection's "portrait experience" concept, joining Portrait Roma in Rome. Portrait properties include rooms customized to mesh with individual guest needs, preferences and pursuits. Walking around can be just fine, but when hotels host activities that complement the surroundings, well, that’s just all the better. Omni Mount Washington's canopy tour—the longest zipline tour in New England—treats thrill-seekers to views of the East's tallest peak. Guests at The Dolder Grand in Zurich are immersed in art history, courtesy of an Art iPad app that provides insider info on the hotel's impressive art collection. Works by Andy Warhol and Salvatore Dali are included in the collection. And Kiawah Island offers the "Wildlife in the Wetlands" bike tour, which allows visitors to explore the magnificent flora and fauna that inhabit the island's diverse ecosystems.